Readers, I got a late start and there were many statistics, so I will append some more material shortly. –lambert UPDATE 2:24PM All done! “Trump Names Digital Guru Brad Parscale Campaign Manager For 2020 Run” . Granted, party affiliation doesn’t translate directly into seats, and seats don’t translate directly into seats in the right places. Nevertheless! 5 days of early voting in Texas shows Democratic turnout up nearly 90% compared to 2014 in 14 counties that supply early voting data to . Republican turnout up just over 10%. I’m not sure about this one. I don’t see why early votes don’t simply cannibalize later voters. IIRC, there was a good deal of pom-pom waving about early voting in the Ossoff race, and from Democrats in 2016. Texas: “In Texas election, a mathematician turned minister looks for winning formula” . The searches I have had time to do don’t tell me Wilson’s position of #MedicareForAll. Readers? California: “Five reporters went to the California Democratic Party convention. Here’s what we learned.” . “Excellent tip. Thank you.” (NOTE: The Tweet has been deleted, but the responses to it still do exist, and fortunately these screen captures were made in time.) These poor people. They really have lost their minds. Maybe there’s a gaslighting operation within the gaslighting operation? Not that I’m foily…. I share this video not to rehash today&#39;s incident, but to redirect attention onto the message I was speaking to, on how economic development policy in the Commonwealth needs to help those living in impoverished areas, not provide tax breaks for large out-of-state corporations. From the Department of What Could Go Wrong? So, we’re going to give the intelligence community the power to decide what is and what is not acceptable political speech? “Since Standing Rock, 56 Bills Have Been Introduced in 30 States to Restrict Protests” . Strange what it’s OK to protest (guns) and what isn’t (pipelines) and who can protest and who can’t. Durable Goods Orders, January 2018: “The major indications on the factory sector are mixed for January with more signs of moderation than acceleration in today’s durable goods report” . “[O]n the factory sector are mixed for January with more signs of moderation than acceleration in today’s durable goods report. Total orders sank a sharp 3.7 percent reflecting more than a give back for aircraft orders as the ex-transportation reading dipped an unexpected 0.3 percent. Unfortunately capital goods are part of the weakness, with core orders (nondefense ex-aircraft) down 0.2 percent in January following December’s 0.6 percent decline.” And but: “Lower than expected and at odds with the ‘surveys’ that show what I’ve called ‘trumped up expectations” . And: “The big news was the second decline in a row in business investment, based on a closely followed measure known as orders for core capital goods” . Then again: “I consider this a strong report as the rolling averages significantly improved. Civilian and defence aircraft were the main drag this month.This series has wide swings monthly so our primary metric is the unadjusted three month rolling average…. The three month rolling average for unadjusted new orders accelerated 2.0 % month-over-month, and up 9.4 % year-over-year” . International Trade in Goods, January 2018: “Exports came back sharply in January to an oversized $74.4 billion goods deficit in January, in what starts off another quarter of trouble for net exports and GDP” . “Exports fell 2.2 percent in the month with capital goods and industrial supplies posting sharp declines and easily offsetting a sizable gain for the smaller category of consumer goods. Imports also fell but much less so.” And but: “More signs of a slowdown as exports fall, which means less gdp, and consumer imports down, meaning personal spending was lower than expected, as discussed might be the case previously due to lower personal income growth” . Richmond Fed Manufacturing Index, February 2018: “After slower growth in the previous two months, manufacturing activity in the Fifth District showed renewed robust growth in February” . “[A]lmost all of the components making up the index indicated a vigorous pickup in manufacturing activity… On the employment front, in addition to the increase in the number of employees, the average workweek… lengthened as well.” And: “The important Richmond Fed subcategories improved, The internals are better than last month” . S&P Corelogic Case-Shiller Home Price Index, December 2017: “Case-Shiller 20-city adjusted home prices rose a strong and as-expected 0.6 percent in December. Monthly gains are all led by Western names” . And: “Many pundits believe home prices are back in a bubble. Maybe, but the falling inventory of homes for sale keeps home prices relatively high. I continue to see this a situation of supply and demand. It is the affordability of the homes which is becoming an issue for the lower segments of consumers” . Consumer Confidence, February 2016: “Market volatility or not, new long-term highs are the continuing story of the consumer confidence index… easily beat Econoday’s consensus and also top the high estimate” . “Market gyrations however are taking their toll on the sample’s bullishness with only 41.3 percent now seeing stocks moving higher over the next six months for a nearly 10 point monthly decline. The bears are now at 27.4 percent, which is up nearly 7 points.” And but: “This is one of those ‘trumped up’ surveys that are at odds with the hard data” . And but: “What stands out about this report is that the cutoff date for the preliminary results was February 15. That means the people surveyed had already seen the panic selling in the stock market” . Shipping: “Labor isn’t easing up its push against the independent-driver model in port trucking. A new lawsuit filed on behalf of three truck drivers is taking aim at a subsidiary of XPO Logistics Inc., and seeks class-action status in a case . It is the latest in a series of action aimed at trucking companies that haul goods at Southern California ports” . I can’t understand why the industry has trouble finding drivers. Can you? Quote is from . Gorsuch in , page 18: “why shouldn’t we take Judge Easterbrook’s admonition seriously, that judicial errors are a lot harder to correct than an occasional monopoly where you can hope and assume that the market will eventually correct it. Judicial errors are very difficult to correct.” He’s talkin’ sense, Merle. Who needs a judicial branch? It’s too slow! 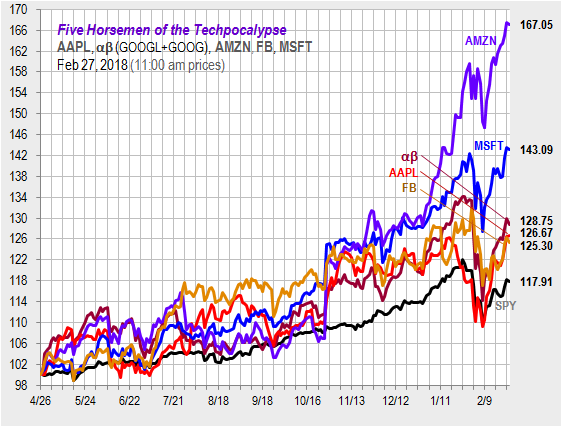 Five Horsemen: “Facebook falls to last place as Apple teases punters with rumors of new iPhones” [Hat Tip, Jim Haygood]. Today’s Fear & Greed Index: 20 Extreme Fear (previous close: 18, Extreme Fear) . One week ago: 18 (Extreme Fear). (0 is Extreme Fear; 100 is Extreme Greed. Last updated Feb 25 at 7:00pm. Now lagged by only two days. What’s the point of a Fear and Greed indicator that craps out at the ends of the scale? Being an academic, there is a great deal of documentation to backup the author’s first hand knowledge. Here’s another reader with a problem like mine, except not so lazy as I am: “Help me learn new things in 2018 – The Fall of Rome/The Dark Ages (What should I read?)” . “This city fights crime with gardening” . “To find out whether renovating neglected lots could lower crime, Branas and his colleagues coordinated with the Pennsylvania Horticultural Society and Philadelphia Division of Housing and Community Development to enlist local contractors to clean up hundreds of the more than 44,000 vacant lots across Philadelphia, Pennsylvania. Some abandoned lots were transformed into parklike settings by clearing trash and debris, leveling the land, planting new grass and a few trees, and building a low, open fence in front of or around the space to discourage dumping and demonstrate that someone was taking care of the space. In other lots, contractors only picked up litter and mowed the existing lawn. The researchers compared this second intervention in combination with the first treatment with a third, control group of lots that stayed the same throughout the 3-year study. They also analyzed police reports and interviewed neighborhood residents during the 18 months before and after the green-up. Compared with leaving the lots as is, transforming lots into parklike spaces or sprucing up them up with trash removal and mowing reduced overall crime by a modest amount, less than 10%. However, the effects were amplified in neighborhoods below the poverty line. There, ” (). I’d love it if this were true, but am I the only one reminded of the “broken windows” theory of policing? Even so, I think it might be better to send gardeners into the neighborhood, rather than the police, regardless of the theory involved! “Debating the Outlook for U.S. Workers” . “Bloomberg contributors Conor Sen and Karl W. Smith have very different views on the state of the U.S. labor market. In a Feb. 22 article, Sen found signs that companies such as Campbell’s Soup are struggling to contain wage inflation, among other costs. Smith doesn’t buy the premise that the economy is running hot enough to generate adequate pay raises and exhaust the supply of workers. Here is an edited version of their email discussion.” Interesting. “What happens when you put evolution on replay?” . “In 1989, famous evolutionary biologist Stephan J. Gould proposed a thought experiment: if you could rewind time and let evolution happen all over again, would the end result resemble life on Earth as we know it? For decades, the idea of ‘replaying life’s tape’ remained purely a theoretical question and fodder for endless debates among scientists. At the heart of the debate is the tension between chance and determinism in trying to understand how an organism’s past constrained its future. The development of recombinant DNA technology – taking a gene from one organism and inserting it into the genome of another – began to provide opportunities for researchers to answer Gould’s question experimentally…. Readers, I’m running a bit low on plant images. So, whether you’re from the tropics or merely anticipating mud season, we’d like to see what you’ve taken. This entry was posted in Guest Post, Water Cooler on February 27, 2018 by Lambert Strether. It is indeed truly beautiful. And on another note I got irritated by one Jerome Powell’s comments, and sent him a complementary copy of MMT from Amazon. I recommend all to send copies of MMT to their Senators & representatives, assuming said S & Rs can and will read. For President Trump, I recommend Enid Blyton’s Noddy and Big Ears series (Now considered racist , because of the stereotypical villain). Would such DDOS attacks be criminal interference with the conduct of bussiness? If NaCap makes and raises just barely enough money to where it could call itself a bussiness? If such DDOS attacks could be tracked back to Brock Inc.; would that subject Brock and Brock Inc. to RICO type lawsuits? We are a business, albeit a bare bones one with what amounts to a socialist subscription model. Maybe someone should go over to 4chan and tell them that Correct the Record wants to take away their internet. That’s a target rich environment Rev. Everyone wants to take away 4chans’ internet, even factions of 4chan itself! It’s funny how “Russophobia” doesn’t have the same stigma attached to it as “anti-Semitism”, isn’t it? It’s one thing to be a warmonger. It’s another thing to believe that Boris and Natasha are going to hijack your limo. I grant that both are insane, but the nature of the insanity seems different; collective vs. individual; groupthink vs. losing your mind. Lot’s of individuals like this woman make up the collective. She is a woman with credentials and must therefore know what she’s talking about. In the background I sense a kind of low frequency vibe, but then I’m just a sexist creep. She’s not, by the way. Or is narcissism in play here? Of course I’m just assuming the driver was man. A Russian woman? We really need a way to make any link and tie to the Clintons into a mark of Cain and a visible leprous running sore. We really need some kind of Clinton Watch to name and track every member and helper from the highest to the lowest of the Clinton Crime Family. Assembling and weaponizing and disseminating such information would assist those people who wish to drive every Clintonite from public life and public view in targeting every Clintonite for relentless eliminationist pressure. Like neocons and Republicans, the issue isn’t the Clinton mafia’s record as much as the refusal of partisans to do an iota of intellectual work on the matter. Admittedly, I do suspect Clintonistas are at a major disadvantage going forward as the misplaced nostalgia for Hillary won’t simply transfer. Then again, “OMG Russia” could be the emotion transferred without an object of devotion such as Obama on the horizon to replace the lost queen. Which partisans are we referring to here? Whose partisans in particular are refusing to do the iota of work? Sanders’s partisans? Green Party partisans? DSA partisans? Which partisans are the ones you are referrencing as refusing to do the iota of work? McCarthy died in 1957, but his torch was quickly retrieved by a deranged C.I.A. inpatient of vast persuasive powers named James Jesus Angleton, who preached that the whole of the Western spook world was being controlled by superheads in the Kremlin. Frank Wisner suffered a nervous breakdown after the failure of the Hungarian Revolution in 1956 and blew his brains out in 1965. It’s those tendriled pod plants from the Dembell Galaxy, drifting through space on a liberal wormtougue-hole … which are only attracted to the upper 20% of the nametag lapel-wearing Humon population. Only the finest russian wodka can resist their deleterious adulterations ! This was her personal Trump moment. The American insanity about Russia is virtually identical to the same propaganda featured in certain European countries in the 1930’s. Russians are both all-powerful and mindless simpletons out to get our pure and rightful place in the sun. In this case, she revealed her hatred is based out of real prejudices not anything she can claim to have heard state secrets about (an excuse to be sure). I’m reminded of Joe Biden’s comment about Obama as “clean.” Insufficient “whiteness” will not be tolerated. Hillary’s super predators. “This guy would have been carrying out bags” as Bill Clinton was reputed to have said about the would be challenger to Hillary. Comparisons of Bernie to a landlord. Palmeiri isn’t terribly far removed. She chose to punch down on a cab driver and revealed herself. Don’t forget good ol’ Bill sneering that Jeremy Corbyn was akin to some smelly homeless dude during the last British election. You stay classy, neoliberals! And the kicker is that the Russian driver probably got her to her destination quicker and for a fraction of what she had expected to spend. I thought at first the tweet was meant as a joke. As in: ha ha but not funny. Just some context here: there are a lot of actual Russions, but also many other Russian-speaking, immigrants in CA. Many people mistake some of the Russian-speaking (from other countries like Ukraine, Uzbekistan, Kazhakstan, etc) people as fully Russian. Ironically someone I use routinely for cab services (I am holding firm on not using Uber or Lyft at this time) is a Russian born in Uzbekistan. Wow, like, NOW I’m so “scared” he’s gonna hyjack me!!!111!!!! to…??? How pathetic, embarrassing, racist, xenophobic, stupidly hostile, and ridiculous. Behold: Today’s Big D party. And they wonder why people like me actually vote third party?? I suppose the next step is to fire all the Russian physicist emigrés from the taxi business, at which point Manhattan will grind to a halt (or would have done ten or twenty year ago; perhaps the demographics have changed). Taleb’s “Intellectual Yet Idiot” comes to mind. Ohh- Yes! The bane of my current career is that while I can with some effort make a flat-coated retriever understand my intentions, I can discuss with a 2.5 year-old grandchild, but, nothing at all sticks on the perfectly smooth teflon-like mind’s of the I.Y.I’s. I.Y.I – “My equipment is extremely important and critical for the continued existence of the universe”. Today I get to discuss why we need about 70% more funding than planned to complete the project. Fun. Fun. Fun. Would someone who said the same thing about a Muslim cabbie be ‘insane’, or just a racist? If she actually thought the Russian cab driver was going to kidnap her, she would have just got a different cab. She’s just casually spewing the kind of bigotry that liberals would never consider acceptable if said about any other ethnic group. the kind of bigotry that liberals would never consider acceptable if said about any other ethnic group. … Except those “Super Predators”, Trump Voters and whoever happens to be not in the current liberal “in-crowd” as defined by “current great liberal leaders and thinkers”. I always disliked that form of liberal “analysis” where what is deemed Good and Bad for a liberal depends on not on the action itself but on “Who is doing What to Whom”. That Pecking Order is the very core of identity politics, which the liberal “in-crowd” loves so much. I think that part of the winning strategy of conservatives is that their ideas of Good/Bad are rather stable and therefore they can support each other over longer periods than liberals, who, will tear into anyone with rabid enthusiasm as soon as the winds – or their political leadership – changes, including each other. Because of their way of flipping between “in-” and “out-people” and that just about anything goes against the current “out-people”, the liberals behave in a much more authoritarian manner than conservatives. You need to ask? Insane, but liberulz would say racist, even though “Muslim” is not a race. Self-flattery in the sense of believing Boris and Natasha would have any reason to bother with her. They’re far too busy retweeting their favored pundit, Joy Ann Reid. Whoch is amusing in its own right. Over-the-top russophobia is a form of virtue signalling. It shows that the russophobe is fully on board with the required mass hysteria. The more absurd the claim, the more powerfully regurgitating it affirms one’s commitment to the narrative, and its inventors. See how ugly that looks? That’s a very effective exercise. If I got into a cab with a Russian driver, I’d be begging him/her for the opportunity to practice my language skills. I can see myself chatting happily in Russian, all the way to my destination. Watch out now Slim. You might end up in one of those FEMA ‘camps’ made out of converted WalMarts. (I read that ‘converted’ Sams Clubs will now be known as “Vlads’ Clubs.”) Ochin horoshaw! As far as the domestic, political meaninglessness of the “Russian affair” this short Jacobin article had a good, short take (). Ironically for the US-establishment narrative of vast Russian conspiracies, I can only imagine how useful this whole “constitutional crisis” is for entrenching oligarch power in Russia. Putin probably pissed himself with pleasure over the Economist cover. Who would have thought a guy that can barely keep his own country together with bribes and intimidation post-USSR would be presented having more international clout than the USA, a privileged and wealthy country with a stable (i.e. dead) democracy and a long and strong track record of invading countries, meddling in democracies, and overthrowing foreign leaders/parties. Is there a word stronger than irony? This sounds like this poor woman is going into Louise Mensch territory. One person in that Twitter thread had it right. In their minds they must think that they live in some sort of Tom Clancy novel/world where the Russian threat is everywhere and they are at the center of it. You know what would be funny? If the Russian spooks decided to gaslight important people like this. You know, go into their homes and move some furniture, go onto their computers and leave a bookmark to RT, adjust the side mirror of their car – that sort of stuff. Mess with their minds and sit back to watch the fun. That explains their lust for war. In Tom Clancy World all of the enemy weaponry always lines up perfectly as targets for American Weapons, that by magic and prophetic wisdom are always specially designed for exactly that days configuration of battlefield and targets. Those weapons and delivery systems always work as designed. Despite this, there is somehow always still a problem with some enemy sneaky-ness, but, there is also always some magical super-weapon that some fringe-boffin just manage to hack into working better-than-designed using some random parts in exactly the moment it is needed (despite years of previous un-patriotic budget cuts and failures using the proper parts during system development). Thinking that “the market” is going to correct a monopoly only shows that you don’t understand what a monopoly is (namely, the lack of a competitive market). So glad we’ve got such serious intellectuals in charge…. The market can correct and cure anything….if you can afford it. Or else it shows that you are an undercover secret agent Monopolism supporter. Which Gorsuch probably is. The lender determined that a method it was using to calculate APRs didn’t properly reflect the full benefit customers should have received for good behavior, such as paying on time, the New York-based bank said Friday in a securities filing that disclosed the issue and the total cost. It’s currently reviewing accounts and plans to have refund checks in the mail by the second half of the year. Jamie Dimon wants the Jeff Bezos deal. The CEO of JPMorgan Chase & Co., which employs more than 250,000 workers, said he’ll call the governor of whichever state Amazon.com Inc. picks for its second headquarters and try to get the same benefits. Dimon also joked that he’d find out which state offered the second-best package to Amazon and move 50,000 people there to get that deal. No one said that the race to the bottom would be cheap. I actually had a very positive interaction at my local Chase today. Since I don’t have a printer, I went over to the local branch to see if they could print out a recent statement for me that I could use to support an application. While there, I explained about the overdraft I had incurred recently, because Ocwen cashed my check immediately, rather than sitting on the check for 3-4 days and then trying to charge me late fees (a practice for which Ocwen is notorious). He came up with a plan to foil Ocwen in future (assuming Ocwen accepts EFT) and he also eliminated the overdraft charge to my account. I thought that was very generous, since I was only asking for advice on how to avoid a similar situation going forward. Kudos to at least one Chase employee. One nice employee does not make an ethical company! Jamie has recently announced that they are going to tear down the existing JPMC headquarters in Manhattan and put up a new, bigger building on the site. To get tax breaks, the financial sector and tech sector point out how many people they employ. They don’t point out their massive investments to eventually replace workers and neither does the business press when writing about these “tax breaks for jobs” stories. Good thing I pay off my 2% cash back citibank credit card every month. ‘Tis better to receive than give when it comes to big banks. Me too, but I’m mindful of the fact that the merchant is paying about 3% to the bank, so that “reward” from the bank is really coming from the merchant’s pocket. If the seller is some behemoth corporation, I’m happy to use plastic and take the 2%. If it’s a small merchant that I really want to support, I’ll pay cash and let them keep the 3%. It’s less on debit cards – 1 or 2%. Just checked on that with the Co-op store manager – who should have known, but looked it up. Always like to add to her education (we’re friends). I go back and forth on using the debit vs. writing checks, which hold up the line a bit. Cash is better, but requires foresight. And unfortunately hindsight, as in “where did the money go”? An important question for most of us. Banks call frequent credit card users that pay off every month deadbeats. Financial humor roolz. Good for them if they’ve figured out how to do that. Sabato does nothing but state the obvious if an intern isnt ghosting. Im fairly certain he has new people, so he wont give the keys over and will have to rely on conventional wisdom a chris Matthews type can follow. If it is a bench of totally different people from the nasty people I interacted with personally in the 1980s, that’s a good thing. If its a bench of totally different kinds of people from the treacherous filth who ran McGaw against Wellstone precisely in order to defeat Wellstone and elect Coleman deliberately and on purpose, then that is a good thing. If it is a bench of more of the same green slime pus as before, that is a bad thing. I am watching DSA’s progress as the possible better alternative which I feel confident the Green Party will never ever be. While the caption “Red-baiting from the right” is certainly correct, I would point out that the d-bag who held up the hammer and sickle is in fact a Democrat from Fairfax county. Having lived in both Fairfax and Loudon counties I have to say that Lee Carter was 100% spot on with the statement he was making while the chucklehead behind him held up the iPad. > the d-bag who held up the hammer and sickle is in fact a Democrat from Fairfax county. Oops. Of course it is. My bad. I grew up as a Democrat. Sometimes, the old reflexes that the Democrats are the sane ones take over. As readers know, I work hard to overcome this tendency, but sometimes I fail…..
Well, that doesn’t make “redbating from the right” inaccurate. On THIS, Dems take no backseat to the GOP. And I think it really wasn’t until the late 70s that seeing a red under every bed fell definitively out of fashion among prominent Dems. At about the point where being a non cold warrior became an electoral positive among much of the Dem constituency. Nobody redbaited better than than classical cold war liberals. About the Philadelphia cleanup-greenup of decrepit lots, why would that remind you of the “broken windows” theory of policing? The “broken windows” theory of policing is that harsh persecution of every tiny littlest “first offence” crime will prevent bigger crime by brute force. Cleanup-greenup of decrepit lots is about habitat improvement with visible living things leading to less stress on people and better outlooks. It doesn’t persecute anybody. So why does it remind you of “broken windows”? Humans are a biological organism. Even inner-city humans. Even they, too, might respond positively to more bio-active growing green plants in their immediate habitat. Edward O. Wilson referred to this basic human organismal instinctual drawn-ness to living things as “biophilia”. I was reminded of Jane Jacob’s discussion of Philadelphia parks in The Death and Life of Great American Cities. A well-used park or garden with frequent neighborhood visitors during the course of the day might contribute to the development of an actual community. Back in the 70s most of entire city block of neighbors agreed to take down their back yard fences thus creating a remarkable collective green strip. But this was during a period of local progressive ferment and neighborhood solidarity that may not have survived the 80s. I should go back to the old neighborhood and see if the fences went back up. I wonder if the response is more to vibrant community action than it is about greener trees, or whiter sidewalks. Anything that beats back the atomization of society is likely to pay dividends. Liberals are now trying to defend Obama’s education policies. The article brilliantly positions Obama as a reformer staking out a middle ground between the unions and conservatives. Otherwise, it’s a pretty standard pro-charter, anti-union article. Hay, wasn’t that guy obomber the one that said I’ll put on some comfortable walking shoe join you on the picket line. I wonder how that worked out? As bad as Betsy DeVos is, one thing that people for grt is that Obama put in neoliberal Arne Duncan. DeVos is a continuation of the same policies. Likewise, take a hard look at what Rahm Emanuel, who is close to Obama and was part of the Obama Administration, is doing to education in Chicago. It is not pretty. A fun read on Russiagate. On truck driving, most team drivers earned up to and over $100,000 per year after expenses. Then came Ronnie-ray-gunn and short haul went to the bottom and long haul followed it. I certainly hold ronny raygun in as low esteem as anybody, but it really was carter that deregulated the airlines and trucking. Yup, it’s a big party and the mopes aren’t invited. Is this the spot to say eff the clintons and trump too, for that matter. Agree on carter but Ronnie brought in truck drivers from Afghanistan in the beginning of the war that never ends. I met a lot of them while working the trades in the SF bay area. They received $1200.00 per person per month so they had no problem driving container trucks for $60.00 a day. They broke the Oakland Teamster back. Then if they are still driving their driving for free and starving. Sad. As for other potus, it just keeps spiraling down the rabbit hole. And then to top it off, the younger bush the stupid fought tooth and nail to bring in the Mexican trucks and truckers. Three to a cab and 50 a day for the lot. A once solid middle class job turned to nothing in less than one generation. Looking at the help wanted ads, they are having quite the trouble filling those cabs these days. Curbside fulfillment for groceries sounds like a great idea with the exception of naturally occurring items that have variability like produce. I think those fullfilment shops should cater to all the “middle of the supermarket, processed items. People can then shopw onsite separately at produce specific stores. Currently, online grocery shopping doesn’t include fresh produce, unless one is using InstaCart. So, that’s not an issue here, if I understand what they’re referring to. Last year, as part of their ongoing effort to beat Amazon, Walmart bought Jet.com, which offers most of the same packaged and canned goods found in their superstores. My guess is orders are either fulfilled from there or from the nearest Walmart distribution center. Thus delivery time can vary from two days to a week. Should Walmart take advantage of this micro-center idea, they might literally be able to deliver at least some stuff the same day it’s ordered. HEB, the progressive Texas supermarket chain, has offered curbside delivery, but one has to get there within a specific time frame. In other words, you can’t say “Have my order for me at 5 p.m.” if you order at noon. Last week, they announced they’ve purchased the Austin-based food delivery company Favor (think GrubHub but with better service). I’m now waiting to see how they plan to use it. And whether conditions for the Favor delivery folk will improve. Economists should be in existential crisis as their science-loaf of a discipline is founded upon “rational humans making rational choices”. It seems 25 million years’ worth of divergent evolution and unconscious desires cannot differentiate economic theory from more fundamental forces. Economics should be grouped with fiction and mythology as sub-disciplines of neurology, all just different maps of desire’s infinite vacuous space. My first thought on the macaques study was “that explains why those who tend towards status objects tend to have the intelligence of monkeys” and had the urge to share it on Facebook. But you said it so much better and really elevated it where it should be. “25 million years’ worth of divergent evolution and unconscious desires cannot differentiate economic theory from more fundamental forces” — BRILLIANT!! IIRC Water Cooler mentioned Austin Frerick ‘s campaign for Congress in Iowa. It seems he has the ability to connect a few dots, and has called out the Iowa Farm Bureau for denying climate change. Yeah, I checked out his webpage and it actually has an ‘issues” link. He supports medicare for all, the reintroduction of glas-stegal, automatic voter registration, free public post-secondary education, etc. So let me see if I understand this. Hillary Clinton won the popular vote. Yet many of the Democratic faithful (and it is a faith-based community, brethren and sistren) hadn’t heard of the Electoral College till The Morning After. Am I to think that all of these smart people were wasting time at brunch when they might have looked at the U.S. Constitution? Or is it that the Russkies slipped the Electoral College into the U.S. political structure some time in, ohhhh, 2014? Hillary Clinton largely lost in 2008 to Obama because the rules regarding delegate allocation were completely unknown to her campaign. Somehow she became a brilliant politician who knew how to win. As the Democratic nominee, she ran and won a Senate Seat in the well known Republican strong hold of the state of New York. She only under performed Gore by 15 points when she ran against a replacement candidate too extreme for Peter King, not the sportswriter. Combined with the post office she had renamed and her foreign policy record which she decided for reasons I can’t even imagine to make the centerpiece of her campaign, people who thought Hillary was a good candidate are simply lost. They probably have to hit rock bottom. Hillary also probably got the NY Senate seat through vote buying. She got WJC to pardon some indicted felons in exchange for crucial votes from their community. NYT had an article about this. Actually, before he became ‘Mayor of 9/11’, Giuliani was grudgingly admired around the state because he (unearned or not) became the guy who ‘cleaned up New York City’. At the time Hills was running for the Senate, her opponent would have been Giuliani. IMO, he would had beaten her; however, he came down with prostrate cancer. Plus, he had a scandal to deal with (using state troopers to help him in his extramarital affair, which led to an ugly divorce). Those two things forced him to step aside (which he took his time in doing so to piss off Gov. George Pataki, who had no love for each other). So instead, she had to run against last minute candidate Rick Lazio, a little known congressman from Long Island, whose campaign consisted of ‘vote for me because I am not Hillary’. To Hills credit, she also campaigned across the state. That helped her capture the cities in upstate NY (which are normally blue) and enough of the surrounding areas (which are purple) to tip things in her favor. > NYT had an article about this. That may be. A link would clinch the matter! Hill-land does not howl at the Constitution which empowers the Electoral College because, you know, the Founders were just great. Imagine changing anything in the sacred texts. Or have I missed something? I mean about the Founders, not the inhabitants of Hill-land. Diverting resources from states that were in play to run up the popular vote score in areas that were out of reach was too reminiscent of the loss to Obama. The 2000 election was so high profile where Team Clinton made many other missteps such as convincing Gore to name Joe Lieberman as his running mate who would later enjoy the support for his failed 2004 Presidential bid of then Lt. Governor Tim Kaine who much like Joe brought real energy of a sort to a flailing campaign. The man says time is linear, but I’m not so sure. It is deliciously ironic that HRC, whose entire schtick was based on her supposed Insider Experience and Super Competence, was undone by something that any C+ remedial high school civics student ought to know about. Or maybe! Putin stole HRC’s only copy of the Constitution, so she couldn’t find out about the EC? Maybe eeevil Russian operatives convinced her not to bother campaigning in the Rust Belt where the icky Flyover People live. Far better to stay in sunny California and yukk it up with the donors! RE: “Be nice to Hillary Clinton online — or risk a confrontation with her super PAC” [Los Angeles Times]. BTW: What the hell happened with Trump’s one massively good idea? Term limits for Congress/Senate…. Somewhat positive news on that front from Tejas, according to the DMNews, Beto O’rourke is besting the human douche ted cruz in fundraising. Odd that Brock’s effort never identified or engaged against the omnipresent Russian menace. However did they miss it? There’s a reason Gibbon’s Decline and Fall is still in print. And it goes right through to the Renaissance. I finally finished it last week, 15 years after acquiring a rather handsome set. The toughest slog are the chapters on sectarian divisions of Christianity (and man there are a lot of those) Homoouison/Homoiouson – who gives a [family blog]? So if I were to do it again I’d go for an abridgment (or just skip those chapters entirely). But overall it’s a hell of a read. Every Classics type enthusiast started with Gibbon as a basis for any work or a crazy game of Civilization. The people who write entire tomes disagreeing with Gibbon or trying to do the Byzantine side of things all go back to Gibbon as a fountainhead, largely because he disregarded Church histories in favor of primary sources. I’d say Gibbon critically used church histories rather than disregarded – half the footnotes (and he was a master of footnotes!) are to deride the interpretation of one monk or another. I have not read it yet, but I plan to, based in part on the enthusiastic recommendation of my daughter, a classics major: Peter Brown’s The World of Late Antiquity: AD 150-750 (Library of World Civilization) (19710. Brown has since written many other books on the period as well, all of which look extremely interesting. History of the English Speaking Peoples. Ive been rereading Gibbon since Nov 2016. His prose is masterful, and his humor has me laughing at 4am. as well as things like Livy(and Machiavelli’s Discourses on Livy), Seutonius, Caesar and Tacitus, etc. Lots of folks seem afraid of those classics, but they are rather easy reads…although the names can get a little cumbersome. The historical rhymes that filter through in these works are amazing. Too busy even to read? Then try ‘The History of Rome’ podcast: It’s just about perfectly for an overview – listening – seventy four hours of it. Episode 179 ‘The End’ a good place to start if you’re interested in the decline and fall (but I’d recommend the lot). “Did Anyone Else Pick Up on the Disturbing Messages in Marvel’s ‘Black Panther’?” [Alternet (DK)]. Bilbo Baggins plays a white CIA agent who is given Wakandan technology for the purpose of killing Wakandans who are attempting to export weapons to oppressed people around the world. And he’s one of the good guys. As are the monarchists. One wonders if in Lybia, Syria, Yemen, Ukraine, Iraq, Afghanistan, et al, they found the white CIA agent *preventing* weapons being spread around the world as dark comedy or simply just a middle finger to the face. No, it’s just crappy propaganda for the American public. You’re probably right that it constitutes black comedy for people who are paying attention. I haven’t seen the movie but from what I have heard, the real message of the Black Panther film is really Make Wakanda Great Again. Apparently a lot of people were looking forward to triggering conservatives with this film but were appalled at what happened instead. Seems that there is a lot about the film that conservatives like Paul Joseph Watson can agree with. Wakanda is isolationist, it has strong defenses and is protected by a great big beautiful wall, is dependent on high tech for their success, it uses its resources fully to give them a great lifestyle, apparently the royals have a all-female personal security detail which was what Quadaffi had, it is ethnically homogeneous, it refuses to let in refugees as they bring their own problems. Hmm, this is starting to sound somewhat familiar. The woke generation is eating it up though. I think there are people who believe they are being genuinely radical by liking Beyonce’s Super Bowl performance or watching this film. I think it’s an expression of the total powerlessness people feel to make any substantial political or social change. I don’t see why early votes don’t simply cannibalize later voters. This being a primary, the candidates are pushing early voting because the pushback against the progressives requires it. It’s the progressives who are out ensuring people make it to the polls, while the establishment party focused on mail-in ballots. The latter notoriously skew toward older voters who go straight for the party-supported candidates. Whether that will work this time around remains to be seen. In 2014, the Dems tried to top their bill with a celebrity candidate whose qualifications were solely that she filibustered a long time in pink sneakers. She ended up defending herself against a personal attack that would only work in “family values” Texas. I don’t know much about this year’s candidate, as I backed Tom Wakely, who is a known progressive. If enough progressives can make it past the primary, we may actually manage to turn that gray at least light lavender. I see Palmieri’s -thing as merely a friendly™ reminder to the Corporate Dem enabling class to always remain vigilant about any threats, whether from the Rooskies, or from the hoi polloi below. Risen vs. Greenwald on Russiagate. In my view, Greenwald pretty much buries Risen on this. The fact that Risen is even interested seems to indicate that he has some version of Trump Derangement Syndrome which has been extensively documented on this site and others. Jimmy Dore explains how badly Risen gets disemboweled. 1) Texas as a tossup state–I’m dubious. Texas is growing (see #2, below), and I’d bet more are moving are minorities and/or moving into Democratic-leaning big cities. And a lot of Texas jobs are NAFTA-related, so not all Texas R’s love Trump. But still, I’m not feeling this. 2) Early voting–Texas with one million more early ballots in the 2016 general compared to 2012. But percentage-wise, the final Texas voting rate , from 58.6% to 59.4% of registered voters. Now, one million more people did vote in Texas in 2016 compared to 2012, but unless they all voted early, you would have to say that more early voting did not really translate well into more voting. 3) Texas House races in 2018, and Mary Wilson. Texas was ( for some classic gerrymandering). Texas has 34 House members. , including the 21st where Mary is running (and, despite the lack of it’s R incumbent, is still Likely Republican). Team D did a good job of fielding at least one candidate for each of the 34 districts; Team R does not have a candidate in four of the 34. There are four D’s and 18(! )( Dust off the #clowncar) R’s running in the 21st, and Texas primaries are “the first in the nation”, next Tuesday. Mary is considered the longshot of the four D’s, and her issues section says only: “I believe people in our country want health care for all, not less health care. We have the resources, let’s put them to work.” At least she says care rather than insurance, but what does her second sentence mean? So hardly an unambiguous #MedicareForAll, as Lambert said, and I couldn’t find anything more definitive either, although she has not been endorsed by Justice Democrats/Brand New Congress or Our Revolution (one of the other D’s, Derrick Crowe, is Our Revolution), so that’s not a great sign. 4) I live just south of the 21st, in the 20th. Joaquin Castro, D, running unopposed in 2018 is my rep. , but it is all about bills he has supported, not his positions. He is not a co-sponser of H.R. 676, as six of his fellow Democratic House members are (five running for re-election). And he has recently been named to the Permanent Select Committee on Intelligence, along with Nunes et al. So…Russia Russia Russia! And running unopposed. .
I’m going to early vote later today in a North Dallas suburb. I will report back and see how it looks on the ground. Is that what she meant by bringing super-predators to heel? RE: Did Anyone Else Pick Up on the Disturbing Messages in Marvel’s ‘Black Panther’? I’m not sure white America is ready for a superhero like Killmonger which sounds like a mixture of Malcolm-X and Leon Trotsky. It’s easier to cast that kind of character as an evil villain instead of embracing any kind of figure which would upset social power dynamics. In their place you’re supposed to idealize monarchs, billionaire war profiteers, scientific mishaps or experiments gone right/wrong, relic wielders, and ancient gods of mythology. You know, the people who didn’t really do anything to earn their power and wouldn’t ever think about challenging the present status quo. That kinda explains why these movies became popular during the Obama administration. Hmmm, Trotsky crossed with Malcolm X you say? My interest in this movie increased significantly. To be honest, I haven’t seen it either. That’s just my general impression of the character from people who have. I had a professor who said that one thing that clearly demarcated aesthetic talk from the fact reporting kind was that there was nothing wrong with saying “X is the case” (e.g. “Water is made up of hydrogen and oxygen”), and being asked how one knew this, say in reply, “My Chemistry Book/Teacher tells me.” But if one said “X is a great symphony/film/etc”, one could not respond to the question how one knew this, by saying “This critic/reviewer tells me.” Or rather, if one did, one’s interlocutor would snort and shake their head… Perhaps he was wrong. Market keeps tanking on what used to be good news. So we’ve reached a point where fodder for bulls is really honey for bears? Everybody eats! Or not. Oh for sure. As we know, tweets often have basic English-rules problems. (Dana Loesch is just an idiot, though). What Natasha meant to write was (quote) Russian Meddling (unquote). Because Rodgers knows where the real Russian Meddling came from, his building, probably the same floor he’s on. He just needs that promotion over the guy that’s doing it so he can tell him to cut it out. 1) You don’t win the election until you have 50+ percent of eligible voters. ELIGIBLE voters, not just the ones that show up. Turn them out. That’s your responsibility. 3) Put a surcharge on the 1%, and use it to give everybody a flat $500 for coming out. Seriously. And here’s a really interesting link, as in “pass the popcorn”. I don’t think Delta should be getting the tax breaks they are. But Cagle just freaking stepped in it… you cannot, as a public official, CAN NOT ask (demand!) a private business give stuff of value to a third party in a quid pro quo for legislation. That is literally jail time, baby. Are Georgia Democrats smart enough to even know this? Steve James is the veteran director of Chicago-based documentaries “Hoop Dreams,” “Life Itself,” “The Interrupters” and the forthcoming 10-part docu-series, “America to Me.” But his first Oscar nomination for best documentary has come with a film set in the Chinese immigrant community of New York. James’s PBS Frontline film “Abacus: Small Enough to Jail” follows the Abacus Federal Savings Bank, run by the Sung family, as it is indicted by the Manhattan District Attorney’s office on fraud charges connected to the 2008 financial crisis. The bank held one of the nation’s lowest default rates, and its founder, Thomas Sung, the family patriarch, subjected its loan practices to rigorous testing and standards. But in 2009, a loan officer named Ken Yu was found to have falsified documents and accepted bribes by borrowers, setting off the Sungs’ suspicions. He was promptly fired, and the Sungs — Thomas’s daughters Jill and Vera help run the bank — reported the incident to Fannie Mae, referred the case to the FBI and hired an investigator to root out any more wrongdoing. in Hollywood on Sunday? Or will his crime fighting adventures keep him in Gotham City? To be fair, she actually comes across as a real human being at times. Particularly where she talks about her mother’s health issues. This might sound odd but it isn’t something that came across much during the campaign. When she appeared to act silly or goofy during the campaign people thought she was having a seizure or something. She never throws her campaign team or her supporters under the bus and is remarkably more restrained when it comes to Berniecrats then her supporters were during the campaign. I skipped ahead to the last two or three chapters and she brings up how John Adams and Thomas Jefferson talked a lot of smack to one another. She doesn’t get any credit for this for not providing some quotes. I was also amused by the fact she called for volunteers and problem-solvers in her summary of Alexis de Tocqueville’s Democracy in America because that’s what the FBI is currently calling a violation of the Neutrality Act. But it does seem that even Clinton notices the absence or formation of any kind of creative minority. People who know her personally say she is very nice but, like, so what? Hitler was nice….to his dog. And back in the day many of those New Yorker capsule reviews were written by Pauline Kael who then put them in her book 5001 Nights at the Movies. Not sure, but she may even have started the practice. When she ran a movie theater in Berkley her squibs in the theater’s calendar led to a gig as movie reviewer and the rest is history. Perhaps Lambert can kick off the book reviews by telling us what he thought about the Grant book. My library has it. Anyway, if you enjoyed “What Happened”, I suggest reading “Fire and Fury” next. Oh, it was definiate a seizure. Watch her get into her SUV. HA! Thanks for the Firesign Theatre throwback. I wish I could … but I can’t. Bit disingenuous that article, isn’t it? Things in it like “the Democratic Party has moved left”. Left of whom exactly? Joseph McCarthy? And when he say “Voters put (politicians) there, and if voters don’t like what their elected officials are or aren’t doing, they should accept some responsibility themselves.” And how exactly are people supposed to do that when they are offered the electoral equivalent of a two-card monte card trick? A study that came out last year showed that what the electorate wanted done was nearly always ignored unless it lined up with what some power group wanted or was not considered important enough by these power groups to let them have it. Maybe having a mass of independents would help to change the power balance in Washington. For 5% after, what, 10 years of nothing? That is Huge. May it be well used. >>> The Great Courses has several courses covering differing aspects of this time period. I made the mistake of returning to my former place of toil, The Chicken Palace, to snap up any true deals available now that the last week in the present location had arrived. As the week progresses, the discounts will grow to a final 90% off on Saturday. Ah ha! I was smart enough to wend my way into the back rooms of the emporium, just to have a look. Imagine my surprise to find the back warehouse full of pallets of merchandise! Luckily for me, I encountered one of the last to be let go workers, and asked him about this vision of affluence. He indicated that management had directed the remaining workers to remove the ‘good’ merchandise from off of the shop floor before the closing sale commenced. So, all of those pallets in the back room were packaged for shipping to the new location. The sale then consisted of all of the true junk left in that particular location. Because of the ‘special’ nature of the closing sale, the usual discounts, for military, old folks, and store workers, were discontinued. I spent an hour looking through plies of stuff that our local thrift stores would have been ashamed to put a price tag on. All so that KKR can extract their kilo of flesh from the downtrodden workers of the American Deep South. When I despondently returned home and told Phyllis that I had not been able to find the particular items I had wanted to get, she laughed. I am a yet sadder, but apparently no wiser a geezer. For Democrats in Washington, the question of how to talk to voters about health care is a vexing one. The question was not about what kind of system the voter would prefer, but a surprising 12 percent still said they wanted their own insurance to be single-payer. Still, it’s unclear what this means in the context of the question, beyond suggesting that at least 12 percent of voters are so passionate about single-payer that they offered it as a non sequitur answer. Skip Intro at 5:25 am, that is both well said and accurate, in my opinion.